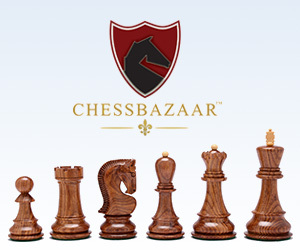 Chess is known for its ornate and beautiful pieces as much as it is for strategy and tactics. Even many people who don't play, or don't even know the rules, will often display a polished wooden set in their homes. Although the standard chess set for international competition has been the same Staunton pattern pieces for the last one and a half centuries, there are many other traditional styles of chess pieces that were in use before the Staunton set became the standard, ranging from the elegant Northern Upright pieces to the iconic characters of the Isle of Lewis chess set. This article aims to serve as a guide to the various patterns of chess pieces, as well as what to look out for when buying a chess set for practical use. When searching for a chess set to buy, you may see descriptions of sets including a size, usually in inches. This is the height of the king, and in a standard tournament chess set, the height of the king is 3.75", so if you are buying a set for use in a tournament (as some tournaments in countries such as the USA require players to bring all their own equipment, including chess clocks), this is the size you should aim for. Sets with 4" or larger kings tend to be very impressive as display pieces, although the larger the pieces, obviously the greater the expense, as larger pieces tend to be more ornately carved. Quite often, you can gauge the expense of a chess set by the detail in the carving of the knight, as this piece usually requires more craftsmanship than the other pieces, which are mostly symmetrical and can be turned on a lathe. When buying a set, it is important to make sure the pieces are satisfactorily weighted, as unweighted pieces can feel too light and prone to tipping, especially if playing on an uneven surface or a roll-up board. Since the mid 19th century, high quality chess pieces have been weighted with lead, and on many sets you can see there is a hole cut into the bottom of the piece where the weight has been inserted, which is usually covered over by felt, so that the pieces do not scratch the board. In some cheaper sets, this hole may be present but no weight has been added, and you will have to weight them yourself. Easily the most recognisable of all chess sets, the Staunton pieces are named after the 19th century English master, Howard Staunton, who is considered to have been the world's strongest player in the 1840s. Staunton himself did not design the pieces - they were designed by Nathaniel Cook and first produced by Jaques of London in 1849 - but lent his name to promote them in one of the earliest examples of sports sponsorship. Staunton pieces resemble smooth columns, tapering upwards from a wide base, and topped with a stylised motif representing each piece. The most recognisable Staunton piece is the king, whose crown is invariably topped with a cross. At the time they were introduced, a number of piece styles were in use around the world. Chess had been growing more popular over the preceding decades, and there was increased ethusiasm for international play and competition, but there was no standard set at the time. Players familiar with different styles of pieces could find themselves at a disadvantage when playing with an opponent's set. The Staunton pieces quickly became wildly popular and have been the standard design ever since. The Zagreb style, and the similar Dubrovnik style which influenced it, are mid-20th century Eastern European variations on the traditional Staunton pattern. They have a smoother, more rounded feel than most Staunton sets, and the pieces commonly feature different-coloured finials (the decorative orbs and crosses that top the pieces), so that the white queen may be topped with a black orb, and vice versa. Another distinctive feature of the style is the shape of the knight, which typically has a curved, S-shaped neck and a downward-pointing face. The Dubrovnik style differs from the Zagreb style, in that the king's crown is usually topped with a simple orb, rather than a cross. Also known as Edinburgh Upright, this style of pieces was one of the immediate precursors to the Staunton design, and was popular in the early to mid 19th century, especially among the European aristocracy. The pieces resemble tall, thin columns, topped with simple motifs. The orb-headed queen almost resembles a very tall pawn, and the bishop's split mitre is typical of the pre-Staunton era. Like many sets of the era, the tall, thin pieces were prone to tipping during play, a problem that was not shared by the sturdy Staunton pieces which would supercede them. However, the Upright style remains a striking and elegant design, worthy of a place within any chess enthusiast's collection. The English Barleycorn style was one of the most popular patterns of chess pieces in England in the early 19th century. They were typically made of bone rather than wood, and the black pieces were often coloured red. The pieces have relatively thin trunks rising from a flat base, and the larger pieces typically feature a highly decorated central 'drum'. A common feature of this design is the flagpole atop the rooks, although this wasn't present in every set. A common problem with the design - at least as far as practical play was concerned - was that the pieces were fragile and could topple or break with rough handling, and the rather ornate decoration was distracting to the eye. Nevertheless, they remained popular throughout the 19th century, although like many other patterns, their popularity declined after the introduction of the Staunton pattern. The Selenus chess set, like the English Barleycorn, was often carved from bone and tended towards slender, elaborate piece designs. This style was popular in Germany and Northern Europe, and was named after the author of a 17th century chess book (Gustavus Selenus was a pen name of the Duke of Brunswick-Lüneburg). The book contained illustrations of pieces that were in use at the time, making the Selenus style one of the oldest featured in this article. The tall, elaborate pieces often featured floral motifs, with upward pointing petals spreading from the central column. In England, the style became known as 'Tulip Chess sets' because of this resemblance. Selenus pieces remained popular in Germany until the early 20th century, when, like many others, they were overtaken in popularity by the sturdier Staunton pieces. The French Regence pieces are named for the Café de la Régence in Paris, one of the most important centres of chess in the 18th and 19th centuries. Almost all the great masters of the period played there, alongside such famous figures as Voltaire and Napoleon. Such was the renown of the Café de la Régence as a chess hub, that the pieces used there - which were of a common pattern in Europe at the time - came to take its name. The pieces resemble stacks of orbs and disks, and like many other sets in use at that time, the queens, bishops and pawns largely resemble each other, differing only in height, and this often led to confusion for players who were unfamiliar with the pattern, and explains why the Staunton pieces readily supplanted them. However, French Regence pieces have remained in use into the 20th century. The Lund pattern was one of a number of similar English playing sets available in the late 18th and early 19th century, including the St George, Calvert, and Merrifield patterns. Like the French Regence set, these patterns all had in common a balustered and ribbed column resembling a stack of orbs and disks, although they shared the mitred bishop of the Upright style, and the queen was usually topped with a point or coronet, making these pieces more distinguishable than in the French style. The distinguishing feature of the Lund style is the roofed tower of the rook, often topped with a flagpole as in the Barleycorn design. These sets were intended for serious competitive play, and their popualarity only waned after the introduction of the Staunton pattern. Also known as Lewis Chessmen or Uig Chessmen, this style of chess set is based on a collection of 12th century pieces found in 1831 on the Isle of Lewis in the Outer Hebrides off the west coast of Scotland. They were discovered by a man named Malcolm Macleod, who, according to one story, was searching for a lost cow at the time. Most of the pieces are now in the British Museum, along with a number of other game pieces found in the same cache. It is believed they were made by a master craftsman in Trondheim in Norway, around the late 12th century, and were lost or buried on their way to Norse settlements in Ireland. The detailed figurines were originally carved in walrus ivory, and are notable for the expressions on each character's face - the queen looks bored, the king stern, and some of the rooks appear to be gnawing furiously on the rim of their shields. While the designs may be a little distracting for practical play - although the pieces are very solid and stable - they have been popular display pieces and even made an appearance in the Harry Potter movies. The most common type of chess set used in clubs, tournaments and schools are a standard 3.75" plastic Staunton set, usually with a roll-up vinyl board. If you have ever visited a chess club or played in a tournament, you have likely seen one of these sets. If you are required to bring your own pieces to a tournament, this is the style of chess pieces you should aim to bring - although some players like to take the opportunity to show off their quality wooden pieces, they run the risk of having their pieces lost or damaged during play. The standard plastic pieces are inexpensive and recognisable to everyone, and it doesn't matter if they are roughly handled. These sets are also good for studying, as some players may find it helpful to train with the same kinds of pieces that they will use in competition, for quicker pattern recognition. When buying plastic pieces, as with other types, check that they are weighted, as cheap unweighted pieces can be very light and prone to tipping. Boards tend to come in a roll-up or folding variety, which both have their pros and cons. Roll up boards can be difficult to flatten and remove creases from, but are more resilient to wear and tear, while many a club has half a folding board in the back of their supply cupboard, as time and wear can result in the two halves coming apart. Travel sets are designed so that the pieces adhere to the board. They tend to come in two varieties - magnetic, and peg-in-slot, and each has its advantages and disadvantages. Magnetic sets tend to look nicer, as the board isn't covered with holes for the pieces to slot into, and you can buy large wooden magnetic sets that are every bit as luxurious as the display sets above. However, especially with larger magnetic sets, the pieces aren't quite as securely fastened to the board and can be prone to falling off and getting lost, if you're having a particularly bumpy ride. Peg-in-slot pieces are much more secure, but this can be a drawback as they can be more fiddly to move. There is also the problem that the peg can snap off if the piece is too roughly handled, both rendering the piece useless and potentially plugging up the hole on the board. 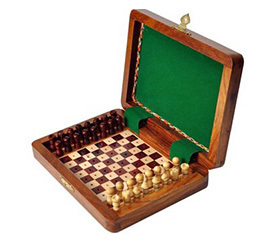 As well as large, almost tournament sized chess pieces, travel sets can come in almost minuscule proportions, and a popular variety of magnetic set is a small wallet-style board with flat disc-like pieces adorned with diagram symbols (in fact, this author learned to play on one such set). 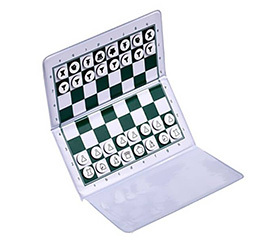 The American world champion Bobby Fischer owned one of these, and carried it with him everywhere so that he could play or analyse a position at a moment's notice. Sizes listed for travel sets usually refer to the size of the board, rather than the king size mentioned previously. Electronic Chess sets connect to your computer or phone via USB or Bluetooth, and use sensors in the board and pieces to detect the locations of each piece. They are used to easily record moves and games, and can provide a much friendlier interface for playing against the computer than the usual on-screen diagram. This type of board is also used in chess tournaments to record the moves for live broadcast. If you've ever watched an online feed of a chess tournament with live updates, then most likely the games are being played on this type of set. 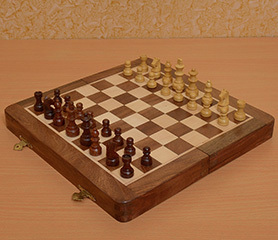 Electronic chess boards are usually designed to resemble wood, and the pieces are often of similar quality to luxury wooden sets.